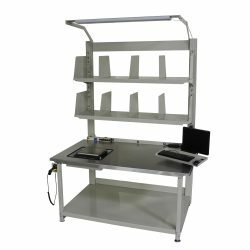 The BHS Shipping/Receiving Desk (SRD) is a fully adjustable packing station, available in flush, left-, or right-hand oriented models with a variety of modular features for optimized ergonomic use. The SRD improves access to essential order-filling supplies, such as barcode scanners, shipping labels, and computer monitors. By matching the specifications of a packing desk to the workforce, facility managers can realize powerful ergonomic benefits, with associated productivity increases. Take advantage of the state-of-the-art BHS manufacturing facility located in St. Louis, Missouri. We can customize your warehouse shipping/receiving desk to perfectly address your facility’s requirements. A custom desk provides an optimized workflow with improved worker comfort, and we offer a virtually unlimited set of customization options for various applications. Call +1 314 423 2075 to speak to our sales team or to find a local dealer.